Dry ice is one of the most tried and true Halloween special effects. Simply drop a chunk into a liquid, then it begins to "boil" and emit a dense, creepy fog. Not only that, it's cheap, simple to use, and way easier to find than you probably thought. It also happens to be fantastic—and fantastically ghoulish—in a lot of cocktails. There are a few tips and tricks you need to know before you just dive right in, but we've got your back. Think of this as your just-in-time-for-Halloween all-inclusive primer. It's Friday afternoon, you've made it through the long week, and it's time for Happy Hour, Gizmodo's weekly booze column. A cocktail shaker full of innovation, science, and alcohol. Am I hung over, or is my brain just haunted? Simply put, dry ice is the solid state of carbon dioxide (CO2). When carbon dioxide gets really cold (colder than -109.3 degrees F, to be exact) it passes directly from a gaseous state into a solid state, forming a hard, white chunk that looks like a block of snow. As dry ice heats up, though, it doesn't melt, it sublimates, meaning it changes from solid to gas without a liquid phase in the middle (like you'd get with water). Hence, dry ice. When you put a little dry ice into a liquid (such as a mixed drink), it begins to rapidly sublimate from the outside in (and it cools the drink nicely). This causes CO2 to be rapidly released, forming large, white bubble which rise to the surface. When the bubbles reach the surface and burst a "fog" is created. The fog is a mixture of CO2, air, and whatever fluid it popped out of. Because it's cold and denser than air, the fog is nice and heavy. It tends to sink, linger in your glass, and creep along a table until it warms up enough and disperses. Most people don't know this, but it is astonishingly easy to get dry ice in the U.S., and it's cheap, too. Your local supermarket is likely to have it (it's typically kept in the meat or deli section) and party supply stores often have it, especially around Halloween. You don't need a special permit or license to buy it, you just have to be over 18. Dry ice typically comes in solid blocks, which is perfect for our cocktails. Occasionally it will come in pellets, which isn't ideal, but it will work just fine. Make sure the dry ice you're getting is designated as food grade. Prices typically range from $1.50 to $3.50 a pound. I went to my local supermarket and got a seven pound block for ten bucks! That should be enough to make more than a hundred spooky cocktails. When you go to pick up your dry ice you may wish to bring (or buy) a cheap styrofoam cooler and some thick gloves for transporting and handling it. Dry ice is generally pretty safe, but it's far from idiot-proof. Just follow these simple precautions, though, and you should be fine. Don't let it touch bare skin. At temperatures below -109.3 degrees F, it can give you frostbite in less than ten seconds. Use thick gloves if you need to handle it, or better yet, use tongs. The dry ice itself must not be consumed. This may be the most important thing you need to remember. Every time you give someone a drink with a cube of dry ice you absolutely must caution them to not let it get into their mouths or especially swallow it. It so cold that they could get internal frost bite in their mouth, throat, or even stomach. The good news? Dry ice is dense, and so it will sink to the bottom of your glass. Just caution people against taking the drink like a shot or inverting the glass all the way. Don't "smoke" your drink. Yes, there are many stupid ways people get drunk without drinking, and one of them is by attempting to inhale their booze. People put a chunk of dry ice into their spirit of choice, and then attempt to breathe the fog in. People have died from alcohol poisoning doing this. Don't do this. Make sure the room you're in has decent ventilation. While a little CO2 isn't so bad (it's the same stuff in your soda water), breathing in too much of it can lead to a condition called hypercapnia. In severe cases it can cause confusion, hyperventilation, convulsions, unconsciousness, and even death. When you're chipping away at it (see below) you must wear eye-protection and gloves. A frostbitten eyeball will ruin your day mighty quick. Don't store dry ice in a sealed container. As it off-gasses it will expand until the contain breaks in a spectacularly dangerous fashion. It can create an insane amount of pressure and send plastic/glass/metal/etc shrapnel flying with enough velocity to do very serious damage to people, places, and things. Let it breathe, baby. Again, despite these warnings, food grade dry ice is generally pretty safe, and all of the above mentioned things are very easy to avoid. You just need to not be stupid. Okay, now the fun stuff. And it really is super fun to play work with. You want to do this within an hour of your party starting, or less than, if possible. Ideally, you'll do it right before serving the drinks, and your guests will probably enjoy watching the process anyway. Assuming you have a block of dry ice, this is what you need to do to make it drink-ready. If you got the pellet version, then you can pretty much skip all of this and just scoop a little into each cup. A cooler or some kind of insulating container. A bowl filled with towels could work in a pinch. Put the sharp end of chisel down where you want to cut. The goal here is to make one-inch cubes, so place the point one inch from the edge. When the metal touches the dry ice, it will squeal and vibrate a little. That's the metal heating it up enough that it sublimates underneath it. It's neat. Using the hammer, gently tap on the chisel at different points along the line where you're trying to cut, until eventually that chunk breaks off. Repeat this process until you have one-inch cubes. And don't stress if they're not perfectly cubic. Transfer the cubes into a ziplock bag or a bowl, and put them back into the cooler until you're ready to use them. The insulation will help slow the sublimation down a little bit, but the clock is ticking. There's nothing you can do at home to stop it completely. Even putting them in the freezer won't help much, because standard freezers typically only go to about 25 degrees F. You'd need a freezer capable of going to -110 to preserve it indefinitely. Make drinks for people as you normally would. At the very end, use the tongs to place a cube of dry ice into their glass. It will fog like crazy, chill the drink, and even impart a little fizz. It will be cool. They will feel cool. You will feel cool. Everybody wins. That's the most important stuff you need to know, but there's something else we should discuss. 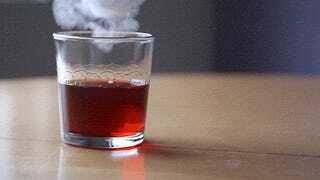 While dry ice will produce that cool foggy effect in any drink you put it in, there's some art to it. The fact is that it will make some drinks taste wonderful and other drinks taste nasty. Why? Because science. The carbon dioxide doesn't simply pass through the drink without a trace. When CO2 mixes with H2O it creates a bit of H2CO3, otherwise known as carbonic acid. This is the exact same thing that happens when you carbonate water with your SodaStream, and it's in any carbonated anything you buy. It's not dangerous in those concentrations, but it will make your drink a little more acidic (as demonstrated in the video above), and that will affect the flavor. Have you ever tasted carbonated water after it's gone flat? It tastes a little more sour, doesn't it? That's the carbonic acid at work. And, as we learned when we were testing a cocktail carbonator, you have to compensate for that sourness, or your drink will be pretty foul. A Dry Manhattan, for example, just doesn't work. You need to add more sweet vermouth to balance out the tartness. In other words, you'll want to taste and adjust your recipes as you go. That said, here are two drinks that work extraordinarily well with dry ice (and look good for Halloween, too). Oh man this stuff is delicious. We've used the Green Beast before when we were making boozy popsicles. It's a punch, so you can make a ton of it all at once pre-party, and then dole it out a cup at a time, adding a cube of dry ice per glass. The greenish hue with the fog on top makes it look like you're drinking nuclear waste, but you won't believe how good and refreshing it is. Mix all of the liquid ingredients in a punch bowl (or cooler, or what have you), and that's about it. Drop a couple fresh, thin cucumber slices into each cup before you serve it and add the dry ice. Don't be lazy and buy lime juice, though. Take the time and juice them fresh. It'll be worth it. This drink is always a massive hit. Okay, fine, it's really just a Negroni, but it's perfect for the dry ice treatment. This dark red cocktails looks like a cup of boiling blood, but it's a wonderfully complex drink. Don't let the fun red color fool you, this cocktail is strong. Normally, you would mix the gin, Campari, and vermouth in a mixing tin with ice, stir it (note: there is a special place in hell for bartenders who shake all-spirit cocktails like a Negroni. That goes double for people that shake Manhattans), then strain it into a glass. For the dry ice version, though, you need to make a little adjustment. Any real cocktail contains a little water. With the Negroni, it's usually achieved through dilution as the ice melts while you're stirring it. For the (Spooky) Negroni, you don't want to add any regular ice because the dry ice will make the drink plenty cold. This is why we recommend adding a little water, which will open the drink up and allow you to taste each of the components more distinctly. Somewhere between a quarter-part to a half-part should do. Start with a little and add a little more until you hit the sweet spot. This is by no means mandatory, but know that without any water you've got an extremely potent drink on your hands. The other adjustment is that normally you want to use a little less than a full part of sweet vermouth. But because dry ice imparts the aforementioned acidity, the extra sweetness of the full part (in the 1:1:1 ratio) actually creates a perfect balance. The dry ice even carbonates the drink, slightly, making it even more enjoyable. Dry ice will, of course, work nicely with other drinks as well. These are just our two favorites. You should experiment with others (and let us know which do and don't work). Just remember, as a general rule, you'll want to go a little bit sweeter than usual and you'll want to add a little more water than usual. Also, we wouldn't recommend using it in cocktails that contain milk (like a White Russian) because the carbonic acid will almost certainly create some gross curdling (at worst) and will make large, messy, exploding bubbles (at best). Congratulations! You are now armed with all the knowledge you should need to make creepily delicious dry ice cocktails. Please heed our safety warnings, then go forth, and rock your Halloween party. If you end up using this stuff, we hope you'll share photos and stories below. 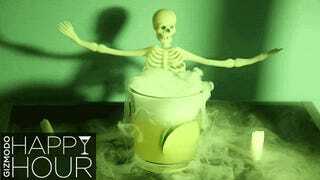 In the meantime, have a great Halloween, and see you next week for another Happy Hour.